There are plenty of online slots that draw in historical elements and it would be fair to say that ancient Egypt does very well in modern day slot representation. It is easy to see why though as there are so many different elements that lend themselves superbly to the action and excitement that comes from playing slots. 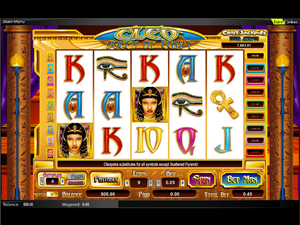 Cleo Queen of Egypt is another slots game that draws on the ideology of ancient Egypt and one of the most famous Queens who ever lived. This game comes from Cryptologic, a reputable and reliable name in the world of online casino software. Cryptologic may not be one of the top companies in the industry but they are well known and it would be fair to say that many players will have played their games from time to time. It is probably fair to say that there are more 5 reel games around than 3 reel games and the Cleo Queen of Egypt game is another example. This is a 5 reels game that has 9 pay-lines, providing a slight twist from the usual 20 pay-line games that are popular at the moment. The range of coin value for this game varies between $/£/€ 0.05 to 5 with the maximum amount of coins that can be used on one play is 9. This leads to the highest amount of value that can be placed on every spin is $/£/€ 45. The Wild Symbol in the Cleo Queen of Egypt game is Cleopatra herself so if you were hoping that the famous Queen would put in an appearance you are in luck. The Scatter Symbol for the game is a pyramid, which means that you get to see all of the traditional Egyptian elements in this game. The graphics may be on the simple nature but they are very clear and bright. Even when the screen gets rather busy, there will be an opportunity to see everything that is taking place and you should be able to keep up to speed with the gameplay. 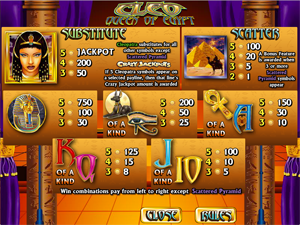 One of the likable facts about the Cleo Queen of Egypt game is the fact that it provides a number of progressive jackpot games. Any player that manages to grab 5 Cleopatra symbols on any of the winning lines will find themselves eligible for that particular progressive jackpot. Depending on your personal stance and opinion about progressive jackpots, the inclusion of one for this game may be a good or bad thing but at least you have the option to decide. It is not as if Ancient Egyptian games or Cleopatra games are thin on the ground but Cleo Queen of Egypt definitely provides players with a lot to look forward to. Cryptologic is a great provider of casino and slots games and their presence behind this slot will help to offer a lot of confidence to players who are looking to a slot game they can rely on. This is definitely a good choice for slots fans and ancient Egyptian fans alike.